You could describe Ender’s Game as Harry Potter in space. It’d be a pretty crappy way of describing it, since Ender came long before Harry , but the similarities are there. We’ve got a school full of kids who are special, an upcoming war, a sport that involves flying around and reaching a goal, and one really special angsty kid who’s destined to save the world. The similarities “end” there, though. 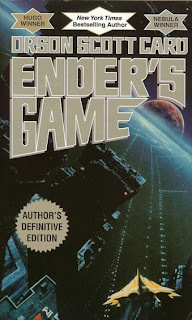 Ender’s Game is not fantasy, but hard science fiction. For a geek like me, it was a delight to read the intricate details of how to maneuver in zero gravity; not only how it affects people physically, but mentally as well (“the enemy’s gate is down”). The sci-fi doesn’t come at the expense of character development, however. Ender is a flawed, rounded out character. Flawed in a Jack Bauer kind of way though; you always know he’ll figure out a way to deal with any obstacle. Often violently. I was amazed at the prescience of Card’s vision of the future. The short story the book is based on was written in 1977, yet many of the technologies described are just coming to maturity in 2010. The Internet plays a large role (especially in the interesting but ultimately rather pointless side plot about Ender’s sister), taking over media and political influence in a way we are sure to see soon. He even threw in a line about kitchen appliances being online; in the 80s, the idea of a human being able to type something up then post it for the entire world to see (hi) would have been mind-blowing, but somehow Card was already imagining Twittering fridges. Part of his genius was keeping descriptions just vague enough that your mind fills in the details with plausible technology. For example, the students’ “desk” computers are described as fitting on a lap and having a screen, but the exact control mechanism is never specified. Of course, I imagined them as iPads. Speaking of which…I got an iPad. This is my first post written on it. My typing is slower and I can’t figure out a way to include a picture, but I still feel like I’ve arrived in the friggin future. Full impressions coming up later.